Hershey Chocolate on Crosscurrents, 2/9 – Doggedly Yours… Howling, Humor, and History. The Hershey Chocolate Company, displaying the name of its founder Milton Hershey, established its Pennsylvania workshop on this date in 1894. 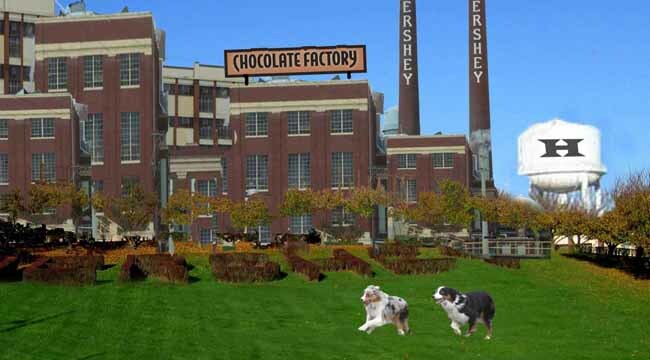 Gavin and Wyatt run toward the factory in hopes of a non-chocolate dog treat. You are invited to find your own Hershey sweet music treats served up by John at the ear-candy studio on Crosscurrents, 2/9 at 8 a.m.